100-year-old Louisa Sale with her daughter Delores Rhodes, who shows the birthday message from Her Majesty, Queen Elizabeth II. Friends and family celebrated Louisa Sale’s 100th birthday at the Home of Compassion in Tamavua, Suva, yesterday. 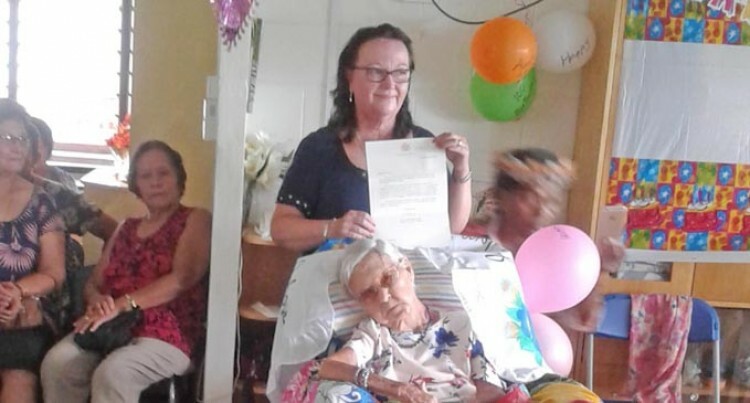 Ms Sale, a resident of the home for the past nine years, celebrated her birthday with the well-wishers including one from Queen Elizabeth II. The celebration took place in the presence of the Republic of the Marshall Islands Ambassador to Fiji, Daniel Johnson. Ms Sale’s daughter, Delores Rhodes, who resides in the United Kingdom, was also present during the birthday celebration. Ms Sale’s son sent his best wishes from New Zealand. Ms Rhodes said it was an emotional bonding moment between her and the mother on her special day. “I travelled from UK and I am very much glad to be a part of her big day to celebrate her 100th birthday with her,” Ms Rhodes said. “My mum was born in the Marshall Islands in 1917 and later lived in Gilbert Islands. “During the war, she lived in Gilbert Islands, then her family decided to move to Fiji as she grew up to be a young woman. She said Ms Sale had loved her children and her family more than anything. “For her, her children were her whole world and she had loved her family very much. Ms Rhodes said she had requested a birthday wish from Her Majesty, which she read out during the celebration. Sister Amy Frances, who has been working for the past 15 years at the home, said Ms Sale was a fun and loving person to be with. “She has been a resident of this home for the past nine years and we all have just loved being with her,” Sister Amy said.